Our group exercise classes are motivating, fun, and full of energy! Check out the schedules, find your favorite, and get moving today! We’ll watch your kids while you workout! Children ages 6 weeks – 8 years are welcome to join us for activities, fun, and new friends — all while you exercise at our gyms in Virginia Beach. Whether your goal is weight loss, toning and strengthening, or busting a plateau, personal training means one-on-one coaching that ensures your exercise is on the right track. 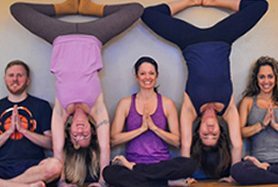 Bring balance to your life with yoga group fitness. Check out our group schedule for classes that strengthen your core, improve your flexibility — and bring body awareness back to center stage. Weight loss programs at iNLeT Fitness help you learn how lifestyle changes, like goal setting, label reading, and exercise, affect your weight loss. We’ll give you the tools you need to succeed! Your mind will drift to its happy place when you indulge and enjoy the spa services at our Virginia Beach gyms. Relax. Unwind. Enjoy a soothing massage or facial — and say goodbye to stress! Welcome to iNLeT Fitness, the premier gym in Virginia Beach. With the most comprehensive amenities available, you’re bound to find the fitness program, equipment, conveniences, and helpful staff that make us the number one gym experience in town. Our weight equipment lends itself to any strength training program, including circuit training and functional training. Meanwhile, we offer plentiful and varied cardio training equipment so you can find a workout you love and never have to wait in line to use a machine. We also offer other forms of specialized fitness equipment and a women’s only fitness studio (Red Mill location only). Our numerous classes offer something for everyone. Whether you are seeking weight loss, strength or endurance training, flexibility, or any other structured program, you can find it in our full schedule of group training classes. Some of our most popular are Yoga, Spinning, Outdoor Cross training (OXT), Zumba, HIIT, BARRE and Tabata. In addition, everyone needs a little help with their fitness programs sometimes. Our trainers offer expert guidance, motivation, and accountability to help you achieve your goals. Personal training, functional training, small group training, and nutritional counseling options are all available to fit your needs. To make your trip to the gym as convenient as possible, we also provide locker rooms, childcare, spa services, and a wide range of membership options to accommodate anyone. Come in today and try us out with a free 3-day pass!